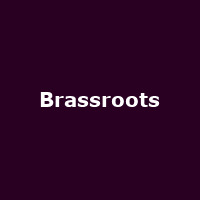 "Brassroots exploded onto London's music scene in 2008, with a foot firmly in the first of the city's brass bands to help establish a flourishing brass band scene in our nation's capital. Brassroots has since set stages ablaze from Ronnie Scotts to Glastonbury, London Jazz Festival to Channel 4's Celebrity Big Brother where they were the house band for the grand finale live episode." The band are fronted by Brooklyn-born "TromboneJerome" Harper.